VF Imagewear, Inc. offers a broad range of high-quality apparel for a variety of business needs — from the boardroom to the factory floor to a company golf outing and everything in between. In fact, it’s likely you are familiar with their well-known brands including Red Kap, Chef Designs, Bulwark, Horace Small, Lee, and Wrangler Hero. Did you know they are also one of the few vendors licensed to produce apparel for the NBA, NFL, and MLB? Each and every year VF Imagewear designs and produces sought after championship t-shirts for the Super Bowl, World Series, and NBA Finals. A large quantity of these tees must be available for purchase within minutes of the game winning score. This demand creates a very specific need for VF Imagewear; the ability to print high volume in close proximity to the winning team at a moments notice. For this reason, VF Imagewear employs strategic regional partners to save time and expense involved in shipping from their production facility in Florida to the winner’s region. Sharprint has been a trusted vendor for VF Imagewear, representing the midwest, for over a decade. We have developed a unique protocol to accommodate VF Imagewear’s time and location based need. Physical proofs of potential designs for print are created for approval days before the game. Come game time, we watch on the edge of our seats at the shop. Each press is fully staffed and armed with screens to print the winning team’s design. Once the winning touchdown, basket, or run is scored, we're ready to print through the night. Do Your Employees Like Their Corporate T-shirts? Custom company apparel can benefit your business in a variety of ways. Branding your uniforms, t-shirts, or promotional apparel with personality can help develop a strong company image that people will remember. 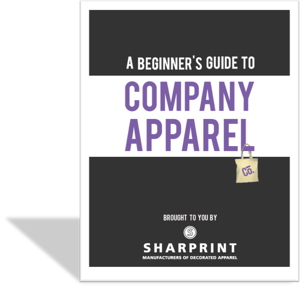 This guide is a primer for the main points to consider when ordering custom company clothing and how to start the process.